Why does space have structure? Why does our universe have not only stars, but galaxies and galactic clusters? Researchers recently identified 234 potential proto-clusters: candidates for early galactic clusters from when the universe was just 3 billion years old that may help solve this astrophysical mystery. Galaxy clusters are vast cosmic structures containing galaxies, huge clouds of dust, and dark matter we primarily identify through its gravitational impact. We have theories for how galaxy clusters evolve — most involving initial gravity fluctuations, dark matter, and a really long time provided nothing nasty like turbulence gets in the way — but what we lack is good observations of proto-clusters to show us what the universe looked like while it was young. Unlike the challenges of seeing the first few moments of time, this is made slightly easier in that galaxies didn't start evolving until the first few billion years after the Big Bang. That may have just changed with new observations from a pair of space telescopes. How Do Galaxies Form? Ask All Your Questions! The observations come from a pair of European Space Agency space telescopes: Planck, a microwave observatory, and Herschel, the only space observatory to cover wavelengths from far infrared to sub-millimetre. The Planck observatory's primary mission is to observe the Cosmic Microwave Background radiation, prying out secrets of the early universe. 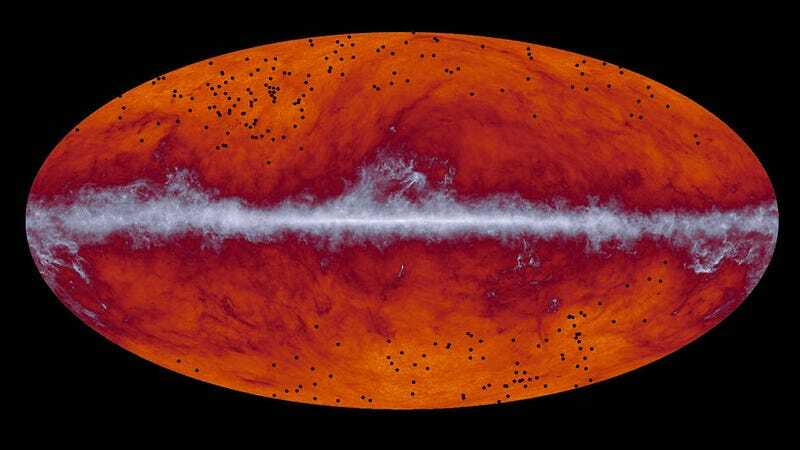 In an all-sky survey, researchers identified roughly 200 extra-luminous objects in Planck's data, objects that date back to the first three billion years after the Big Bang. While bothersome foreground noise for cosmological research, these objects were perfect targets for Herschel to make follow-up observations in greater detail. This is early research so far — the team is still making observations to pin down distances, luminosities, and ages — but it looks like these may be the earliest proto-clusters, groupings that one day evolved into the galactic clusters we observe around us now. If confirmed, these proto-clusters are a half-billion years older than the next-oldest observed galaxy cluster, and may bring us new insights into how the structures first formed. Even with just preliminary data, what they have found is surprising: the objects are young galaxies producing stars hundreds to 1.5 thousand times faster than star production in our modern Milky Way. "Finding so many intensely star-forming, dust galaxies in such concentrated groups was a huge surprise. We think this is a missing piece of cosmological structure formation." It was an exciting, chaotic time for our universe: stars, galaxies, and clusters all forming at the same time, and we really don't know exactly what was going on. It's going to take a lot more work to verify these proto-cluster candidates are what we think they are, and even more to understand how the new and future observations of them will impact galactic cluster formation theories, but that's what makes this so exciting: It's another reminder that this is a vast, mysterious universe and we have so much more to learn.